MaltaIndependent 27/11/2013: The coming year may be exceptional for Malta Freeport as business is expected to boom in the already successful shipping operation, which flourished from its early days way back in the early 1990s. Sources close to the shipping industry revealed with this newspaper that following the setting up of a consortium among three of the largest container lines in the world: CMA CGM, Maersk Line and Mediterranean Shipping Company, business passing through the Mediterranean transhipment hub will increase since CMA CGM has 50% shareholding in Malta Freeport. 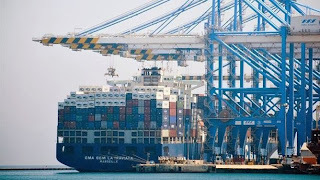 The Freeport employs some 1,200 people and ranks twelfth among the top European ports and is the third transhipment and logistics centre in the Mediterranean region. The Danish, Swiss and French carriers, now dubbed as P3, plan to start operations in the second quarter of 2014, subject to obtaining regulatory approval. Over the next few weeks, news is expected on the proposed P3 Network as regulators in the US, Europe and China decide whether the massive vessel-sharing agreement among the world’s three largest container shipping companies is anti-competitive and therefore...read on.